and convention centre CEO Miller Matola. 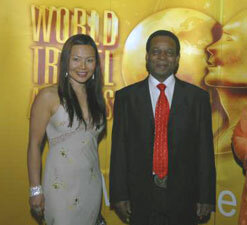 Manon Han of the World Travel Awards. From top destination to best safari, South African tourism was prominent at the recent World Travel Awards ceremony for Africa, the first Africa regional event in the 15-year history of the awards. Held in Durban in May 2008, the ceremony took place alongside the 2008 edition of the Tourism Indaba, South Africa’s premier travel trade exhibition. Launched in 1993, the World Travel Awards recognise excellence in the world’s travel and tourism industry and are voted on by travel professionals from 167 000 tourism-related companies in more than 160 countries. With 919 categories in total, a World Travel Award is viewed as the ultimate honour for a travel product. The influential US-based Wall Street Journal referred to them as the “Oscars of the global travel industry”. South African Airways, the national carrier, was named Africa’s Leading Airline and OR Tambo International in Gauteng is Africa’s Leading Airport. 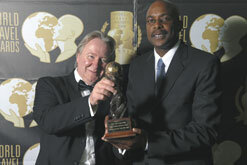 In the category of Africa’s Leading Family Resort, the Arabella Western Cape Hotel & Spa was the winner. Africa’s Leading Travel Agency is Club Travel, the largest independently owned travel agency in South Africa. On the wild side, Africa’s Leading Safari can be experienced at Shamwari Game Reserve, while the luxurious Sabi Sabi Private Game Reserve was named as Africa’s Leading Safari Lodge. The venerable Mount Nelson in Cape Town, established in 1899, is Africa’s Leading Hotel. Africa’s Leading Hotel Brand is Sun International, and Sun City, one of Sun International’s flagship resorts, is Africa’s Leading Resort. In the country-specific category, the Saxon was named as South Africa’s Leading Boutique Hotel, and the Westin Grand Cape Town Arabella Quays is South Africa’s Leading Business Hotel. South Africa’s Leading Hotel is the Cape Grace, with Thanda Private Game Reserve coming in as the country’s Leading Safari Lodge. Finally, South Africa’s Leading Golf Resort is Fancourt. Visit the World Travel Awards website for a full list of the winners. The Africa leg of the World Travel Awards included 75 categories, and with more than 500 nominations across every sector competition was fierce among the travel agents, tour operators, hotels, resorts, conference centres and other destinations that battled it out for the top spots. South Africa vied with Botswana, Cameroon, Cape Verde, Egypt, Gabon, Gambia, Ghana, Kenya, Morocco, Mozambique, Namibia, Nigeria, Swaziland, Tanzania, Togo, Tunisia, Zambia and Zimbabwe to be recognised as the best African travel product. The standard of entries was extremely high this year, said Manon Han, Executive Vice President of the World Travel Awards. “The World Travel Awards Africa ceremony is proof that the industry is striving for improvement and, crucially, in every aspect of the customer experience. These awards are the most prestigious and highly coveted in the hospitality, leisure, travel and tourism industry in Africa,” she added. Besides Africa, other regions include Asia/Pacific, Caribbean, Central and Latin America, Europe, Middle East, North America and South America. Events are held in all regions and the grand final takes place in December – this year the Turks and Caicos islands in the Caribbean is the coveted destination. The next regional event takes place in Sydney, Australia, followed by Shanghai, China. 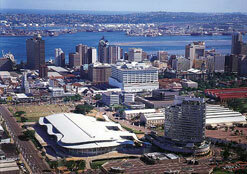 The Tourism Indaba and awards ceremony were held at Durban’s Inkosi Albert Luthuli Convention Centre, formerly known as the International Convention Centre. The centre is one of South Africa’s top conference venues and is itself a multi-World Travel Award winner, having taken top honours as Africa’s leading conference centre a number of times. In fact, the centre took the award again at the 2008 ceremony and just hours before the start of the event CEO Miller Matola signed a deal confirming it as the venue for the 2009 event. Zulu monarch King Goodwill Zwelethini, just one of the many dignitaries in attendance, opened the 2008 ceremony. In between the awards and dinner guests were entertained by the likes of award-winning local band Freshlyground and up-and-coming group Sterling EQ.